During his introductory remarks, emcee Dale Connelly informed the overflow crowd Sunday at St. Joan of Arc Catholic Church in Minneapolis that they would eventually hear from Peter Ostroushko, for whom the evening was a potluck fundraiser. 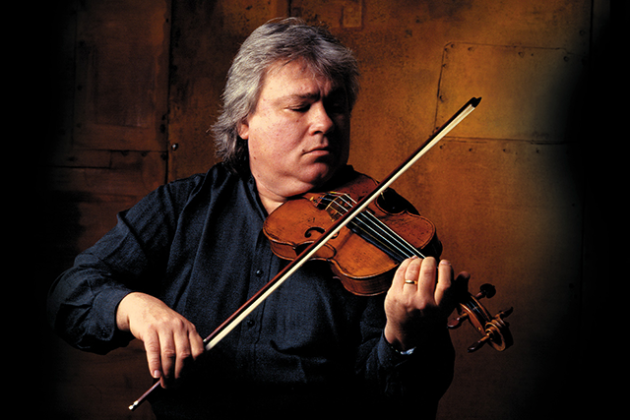 The virtuoso Minneapolis mandolinist/fiddler had suffered a stroke in January. But nobody in the church was ready for Ostroushko’s remarks. Not for the humor. The honesty. The warmth. The grace. The inspiration. He spoke for a full 20 minutes. Seated in a wheelchair, Ostroushko, 63, explained that the stroke had left his left arm useless. “I can’t play an instrument,” he pointed out. “My voice is compromised from the stroke.” Just then church bells rang. “Hello?” Ostroushko responded. The veteran musician’s prognosis is uncertain. He’s doing physical and occupational therapy. Obviously, his mind is intact. During his speech, Ostroushko thanked the various musicians who were performing on Sunday and providing a history of his musical life. He told stories about his days with the Sky Blues Water Boys playing country music in downtown Minneapolis in the 1970s and the group’s singer, Becky Reimer Thompson, giving him driving lessons in a borrowed sports car with a stick shift. And about traveling with musician Daithi Sproule and learning that the Irishman loved Fred Astaire so much he’d do the dapper one’s dance steps in their shared motel room. “He doesn’t do it in public,” Ostroushko joked. Ostroushko spoke of his relationship with God. And he saluted his wife, Marge Ostroushko, not only for being his caregiver and source of hope and strength but also for organizing three choirs to sing to people suffering from Alzheimer’s. He also acknowledged his daughter Anna, who just graduated from Hamline University. The uplift of Ostroushko’s talk, which earned several standing ovations, offset the disappointment that the night’s headliner, Peter Yarrow of Peter, Paul & Mary renown, had cancelled because he was suffering from pericarditis. In an evening that was a bit like “A Prairie Home Companion” without Garrison Keillor, there was plenty of rewarding acoustic music from the likes of Becky Thompson, Laura MacKenzie, Dakota Dave Hull, Ukrainian singer Natalie Nowytski (Ostroushko’s Ukrainian and proud of it) and Ann Reed, who led a rousing sing-along of “If I Had a Hammer.” And some storytelling from Kevin Kling. By the end of the night, more than $89,000 had been raised toward a goal of $125,000 on the Peter-and-Marge page on gofundme.com.